The way she approaches practice (mentally) and the way she approaches games are completely different. So how can you help her be more relaxed in the game like she is in training or more intense in training like she is in the game? Well, if you’re not the coach and don’t control her training environment, then, either she needs to put some pressure on herself in practice (i.e. think of game like scenarios in her head while she’s hitting), OR she needs to find ways to relax. Have her take a deep breath and clear her mind before going in to the box. Give her only ONE thought to take into the box with her. Watch the language you use when you speak of game situations and practice situations when you talk with her. Is the language you use the same for both? Or are there “have to” messages coming through for game performances that aren’t there for practice. Make sure she trains in the gear that she plays in. Every day (or as often as possible), go through an actual game at bat in your mind. From taking the signal, to approaching the box, to setting up in the box, to looking out at the pitcher, to seeing the release of the ball, to clearly seeing the ball come in to your hitting zone, to hitting it solidly while actually executing a full speed swing with a bat. See, feel, and execute the entire experience over and over and over again. Put yourself in that situation daily, then “go there” in the game as well. Feel as calm and in control when you enter the box in the game as you do during visualization. Your focus in the game should be as such that the experience is just as “quiet” in the game as it is in your visualization training. Recreate what you practice/visualize in your games, your feelings, your thoughts, your demeanor, your movements, etc, etc, etc. 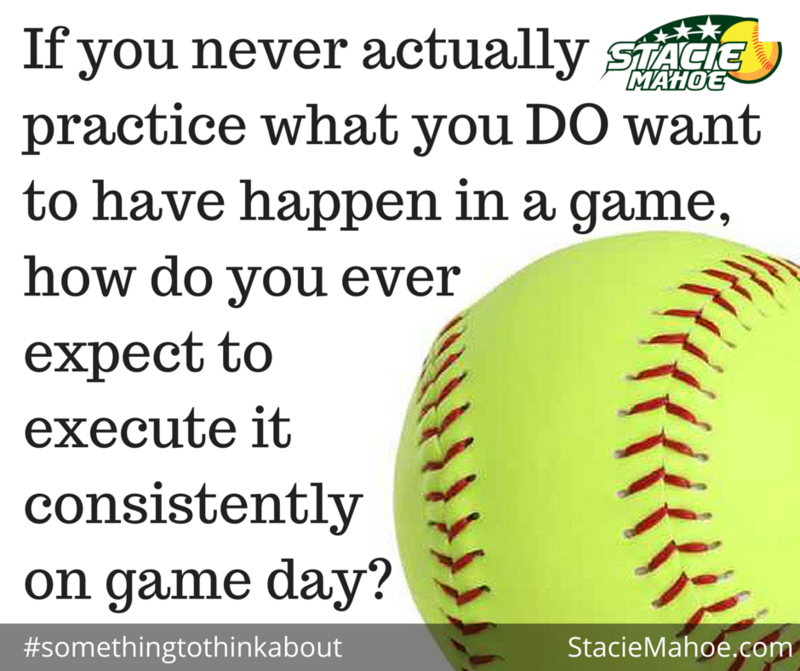 If you never actually practice what you DO want to have happen in the game, how do you ever expect to execute it consistently on game day? I’m grfeatul you made the post. It’s cleared the air for me.